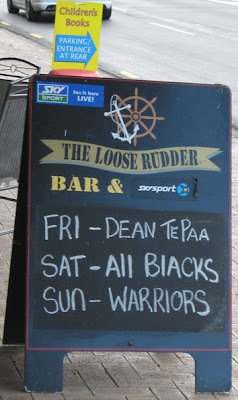 I found this sign outside a bar in AUCKlAND, NEW ZEAlAND. Hopefully this is your first example of a Kiwi lowercase L! The All BlACKS won, so we might not be able to write properly but at least we produce good rugby players. As it happens the Warriors won too. Unfortunately I've got no idea who Dean Te Paa is so I can't tell you whether or not he won. Are you sure that isn't the Warrlors, Chris?